Over 500 pages in length, the epic saga of the Iron Kingdoms comes to life in this momentous book by award-winning Privateer Press author Douglas Seacat. 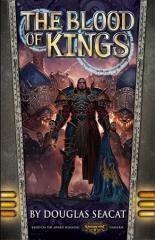 Taking up the story that has propelled the WARMACHINE setting for over a decade, The Blood of Kings depicts the world-changing collision between the sitting King of Cygnar and his exiled brother, Vinter Raelthorne IV, in an unprecedented battle that will leave a kingdom in flames. An event unto itself, this is the book that every fan of WARMACHINE and the Iron Kingdoms setting has dreamed of since the advent of the original Witchfire Trilogy!